According to the American Heart Association Guidelines cardio-pulmonary resuscitation (CPR) and defibrillation saves lives. The 2010 Guidelines say that rescuers need to focus on high quality CPR, which when administered at the proper depth and rate can potentially save a victim. Used in conjunction with an automated external defibrillator (AED), CPR moves blood through the heart and into the heart muscles providing crucial help to the ineffective heart. A school shall, subject to available funding, provide and maintain on site, in each facility where instruction is provided, at least 1 automated external defibrillator, AED. If a school is used for school or district sponsored or approved curricular or extracurricular events or activities including, but not limited to, school sponsored athletic contests, the school officials and administrators responsible for the school facility or athletic contest shall ensure the presence of at least 1 AED and AED provider. If a school sponsored athletic event is held at a site other than a school facility, the school officials shall ensure that an AED and AED provider is on-site. Medford Public Schools Current Capacities: Every school building has a minimum of 1 AED in the building, accessible to the general public. AEDs are stored in well-marked and unlocked, wall-mounted cabinets. Upon opening the door an alarm is activated, alerting others in the building that an emergency is in progress. 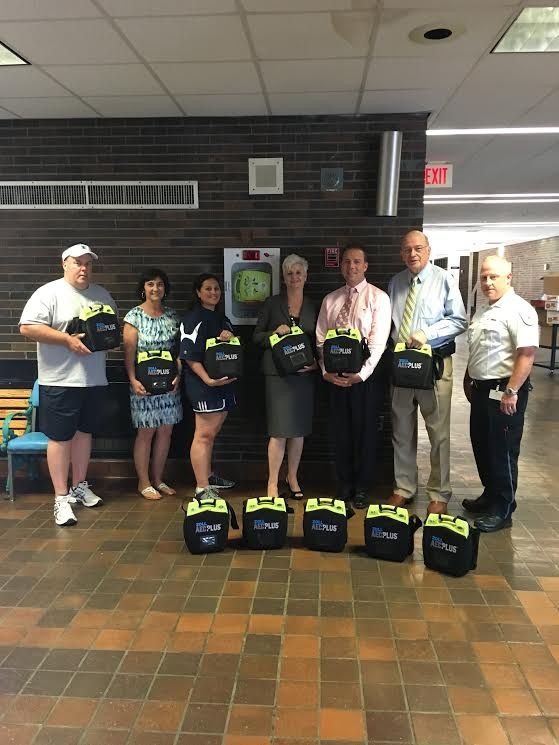 “The Medford Public Schools would have been required to purchase (16) AEDs for use by athletic coaches during off-campus practices and events. The anticipated purchase cost would have been $15,200. Armstrong Ambulance stepped up and donated them to the schools. We can’t thank them enough for their generosity in helping to keep Medford safe. They are an important member of our team, here in the City of Medford”, said Mayor Burke. “In addition, Armstrong Ambulance also provides CPR/AED/Narcan training to MPS staff members and Grade 12 students free of charge. We appreciate this partnership as we work together to meet the safety needs of all students in the Medford Public Schools”, said Toni Vento, RN, Supervisor of Health Services. “It is important to AEDs accessible to faculty, staff, coaches and students. My hope is that you will never have to utilize them”, said Richard Raymond, CEO, Armstrong Ambulance.